It’s been a while–a good long while–since I undertook any baking. 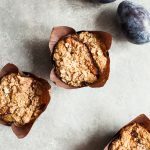 Yet I was inspired to do so this past weekend, and what resulted–these nutritious berry hemp spelt muffins–were a good reminder that I ought to be baking more often. They’re brightening up the rainy spring weather here in DC, and even though it’s not really berry season yet (I used frozen), they’re probably going to be a regular recipe for me this coming summer. The muffins feature what’s probably my “go-to” whole grain baking flour, spelt flour. 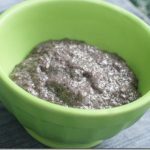 As most regular readers of this blog know, I use a variety of flours in my baked goods, including regular all-purpose, whole wheat, and different combinations of ancient and gluten free grain options. No matter how many flours I try, I always return to spelt as a choice that’s both nutritious and also mild-flavored. It’s so versatile, and it’s especially nice when it’s combined, as it is in this recipe, with all-purpose flour. What can I tell you about these muffins? They’re super moist, but the tops have just a touch of crisp, crumbly texture. They’re filled with juicy berries, which add a touch of tartness to an otherwise mildly sweet baked good. 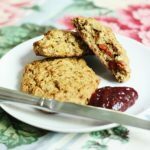 Because they’re made with whole grain flour as a base, and because I added shelled hemp seeds to the recipe, they’ve got just a little extra plant-based protein to offer you, wrapped in a package that tastes like an authentic bakery treat. Spread with a pat of vegan buttery spread or jam, they are a very wonderful way to start the day. Preheat oven to 350F. Lightly oil or line 10 muffin tins. In a large mixing bowl, whisk together the flours, baking powder, cinnamon, salt, sugar, and 3 tablespoons hemp seeds. In a separate bowl, briskly whisk together the vinegar and almond milk. Stir in the oil and applesauce. Add the wet ingredients to the dry ingredients and mix until just combined (a few small lumps are OK). Fold the berries gently into the batter. Transfer the batter to your 10 lined muffin tins. Sprinkle the remaining 2 tablespoons hemp seeds over the muffins. Bake for 24-27 minutes, or until the tops of the muffins are golden, rotating the pan once halfway through baking. Transfer the muffins to a wire cooling rack to cool before enjoying. Store muffins in an airtight container in a cool place for up to 4 days. 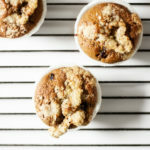 Leftover muffins can be individually wrapped and frozen for up to 4 weeks. A great many of my baking endeavors draw inspiration from the wonderful Dreena Burton, and these were no exception; I took some pointers from her super easy “BF Blueberry Muffins” (from Eat, Drink, and Let Them Be Vegan). Dreena is a really great guide through the ins and outs of vegan baking. If you’re not into berries, or if you don’t have any, you could replace them here with chopped dates, raisins, apples, or another fresh or dried fruit. And any type of chopped nuts or seeds would make a great topping in place of (or in addition to) hemp. I love flexible baked goods, and I hope you’ll enjoy these! Speaking of baked goods, I can’t believe I forgot to share this recipe with you. That right there is vegan date walnut bread. 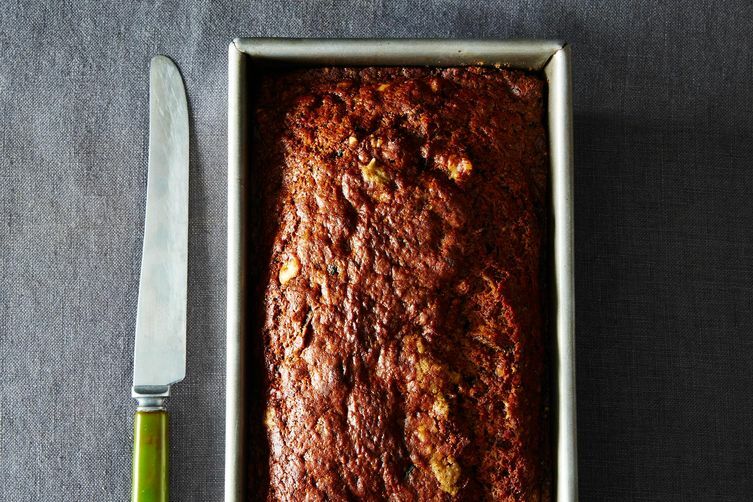 It is moist, rich, and full of sweet, caramel-like ribbons of pitted medjool dates. I posted it on Food52 last week, and I suggest you check it out immediately. On that sweet note, I wish you a happy Thursday evening! I was excited to hear just a couple of weeks ago that Ezekiel products are coming to the UK! At the moment the market for spouted grain products is virtually non-existent. Love the look of these muffins. Berry-licious! These look perfect! I’ve been on a baking kick recently (even though it’s getting warmer out, go figure) and these look like something I need to make. Who doesn’t like a good muffin? I love the One Degree Cacao Crisps:) So awesome that they use coconut sugar! I have Dreena’s Cook Book and Love it. Although I have never made the muffins you reference. yours look great and I love that you only use 1/3 cup of sugar. Ok but now I am checking out that date bread because it looks amazing X 1000! I love the hemp addition. Those look incredible….. Can’t wait to make them! These look delish – can’t wait to try them! I use quite a few of the One Degree products and really enjoy them (especially the puffed rice cereal which I hadn’t found a good organic brand I liked for granola bars and such). I wondered if you have a take on the “veganic” aspect of them? Not that I think using less animals products is a bad thing by any means, but if the manure/compost to fertilize organic plant foods includes some natural, organic animal product (from well treated animals that are frequently an integral part of sustainable farming), is that something you still try to avoid or have a problem with and, for any particular reason? Or is it just the general contribution to, and relationship with, undesirable farming practices those types of fertilizers tend to have when it comes to large scale production like this? Of course, totally understand if you don’t have time to answer- you’re a busy bee! Thanks! 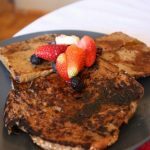 These looks so delicious – I’ve actually got some spelt flour that needs using up! I was wondering if you have any tips for iron deficiency/anaemia? My recent blood test showed me to be mildly anaemic, kind of makes sense as I’ve been having a lot of the symptoms! These were really moist and delicious! I would note that they’re aren’t overly sweet (which I happen to like), but if you like a sweeter muffin, I would increase the amount of coconut sugar in the recipe. BTW, this recipe needs to use baking POWDER, not baking soda. I tried both and there’s a definite difference in taste! Ugh, Holly, I’m so sorry for that error! (And I am so glad you commented, since I hadn’t caught it.) I wish I could make you a batch to make up for the bum batch you must have gotten from the soda. Big apologies, and thank you for letting my readers know.